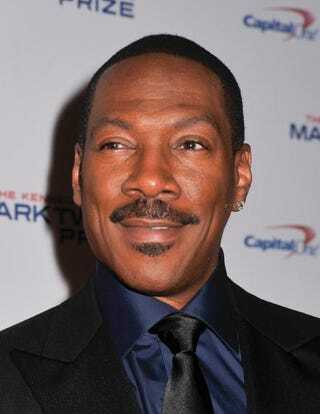 Honoree Eddie Murphy poses on the red carpet during the 18th annual Mark Twain Prize for American Humor at the John F. Kennedy Center for Performing Arts Oct. 18, 2015, in Washington, D.C.
On Sunday night, Eddie Murphy was honored at the Kennedy Center for the Performing Arts as he received the Mark Twain Prize for American Humor. Murphy was surrounded by comics who were inspired by him, including Tracy Morgan, Trevor Noah, Chris Rock, Dave Chappelle and Arsenio Hall. During the ceremony, Morgan shared what Murphy meant to him. "He's the reason I'm in comedy. He's the reason I have a job. He's the reason I have a career," Morgan said. Both Morgan and Murphy are alums of Saturday Night Live, and Murphy quite possibly did pave the way for other black comedians who have appeared on the show. As Murphy received the award, he was full of jokes as usual. And some were directed toward Bill Cosby, the man he refused to joke about during SNL’s recent anniversary show. "Actually, it's an award, but they call it a prize," he said. "Usually when there's a prize, there's money." Murphy joked about recent incidents involving Cosby when he’s been asked to return honorary degrees, and said that you know you've messed up "when they want you to give your trophy back." "I would like to talk to some of the people who feel like I should give back my motherf—kin' trophies," he said. "You may have heard recently that I allegedly put the pill in the people's stomach. … If I ever see or meet this Hannibal Buress in person, I am going to try and kill this man!" Murphy continued. You'll be able to catch the Murphy tribute in all its glory Nov. 23 on PBS.